1. Boil the beans till tender. 2. Add oats and cook till all water has dried up. 4. Fry the onions and tomatoes till all liquid has evaporated. 5. Add this to the oats mixture along with crumbled bread slices. 6. Add the lemon juice, chilli powder, black salt, chaat masala, coriander leaves and green chillies. 7. Mix well until all vegetables are mashed properly. 8. 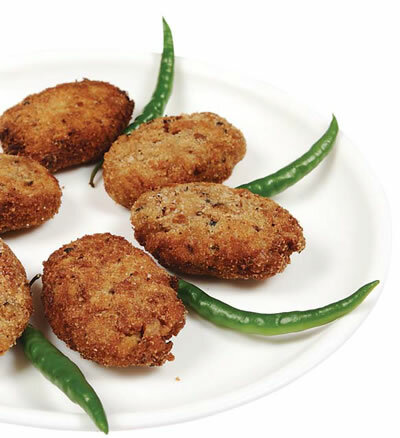 Make small balls of this mixture and shape into desired cutlet shape. 9. Roll them in breadcrumbs and fry on both sides in hot oil. 11. Serve hot with green chutney or ketchup. Feel free to comment or share your thoughts on this Beans and Oats Cutlet Recipe from Awesome Cuisine.